The Devon Rex Cat emerged as a breed in Britain in the 1960s when an animal welfare worker took in a litter of feral kittens from a disused tin mine, including one with a sparse, soft, wavy coat. She kept this kitten and called it Kirlee. 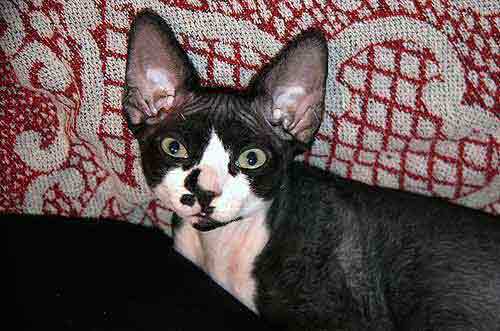 Initially, the cat was thought to be a curly-coated Cornish Rex, however test mating proved differently. It was recognised as a separate breed in Britain by the 1970s, and in the USA in 1979. They are considered rare in the US. The term "rex" means curl. This breed has a striking appearance. Its coat is very short and soft, with a distintive curl. This makes it easy to groom. 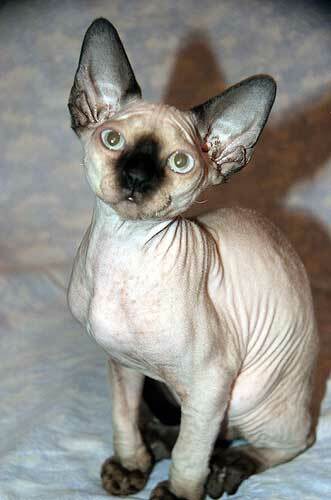 If you are allergic or sensitive to cat hair, this could be a good breed for you, as it doesn't shed much hair. The head is broad and wedge-shaped, with very large, widely-spaced ears, set low on the head. Their eyes are large and noses are slightly upturned. They are often described as pixie-like. Strangely, they often look as if they have no whiskers, but this is not strictly true. They have very short whiskers which are usually curly, and therefore can be hard to see. They have a medium build with long slender legs. Their broad chest can make them look bow-legged from the front. 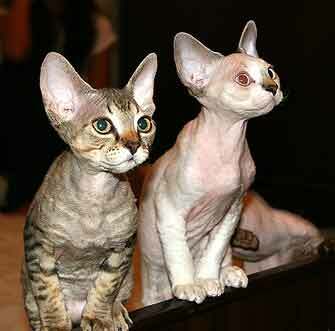 Devon Rex cats are chatty, bright and affectionate. They are known for wanting to nestle close to the head or neck of their human companions. Extremely active and playful, some breeders liken them to monkeys because they are high-jumpers and mischievous. They are very intelligent and can be taught tricks such as fetching and jumping on command.